The Magnum Viper Pro waterproof leather 8 inch boot sits above the ankle and features an SRA slip resistant and shock absorbing high traction durable outsole. 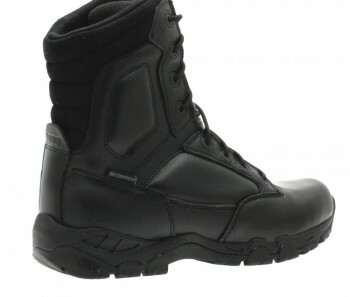 The Magnum Viper is a waterproof upgrade to the current Irish Defence Forces boot. The Magnum Viper boots have a durable full grain leather upper and a breathable and fully waterproof bootie construction. A Cambrelle® inner lining wicks sweat away from the foot while a padded foam collar and tongue, EVA midsole and removable contour moulded shock absorbing PU foam insole provides extreme cushioning comfort. Non-metallic hardware keeps the Magnum Viper boots scanner safe and the non-metallic composite shank offers lightweight support. The Viper Pro 8.0 Waterproof also features a ¾ bellows tongue, moisture wicking laces and foam ankle roll pads for protection. Underfoot, a durable SRA slip resistant carbon rubber outsole provides high traction on slippery surfaces and tough terrain.